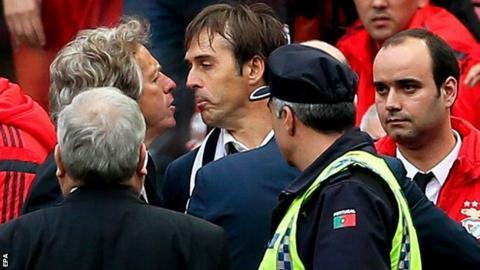 Benfica boss Jorge Jesus and Porto counterpart Julen Lopetegui were pulled apart after confronting each other at the end of their sides' 0-0 draw. "It's not normal, it was the adrenaline," said Jesus, after the pair eyeballed each other at full-time. Jesus' side remain three points clear of Porto at the top of the Portuguese league with four games to go. It was the first time Benfica have failed to score in a home league game since losing to Academica in 2009. Jackson Martinez came closest for Porto, wasting chances either side of half-time. However, Benfica could have snatched all three points and tightened their grip on the title when substitute Ljubomir Fejsa shot over the bar from close range late on. Porto suffered a demoralising 6-1 defeat by Bayern Munich in the Champions League quarter-finals on Tuesday, a result celebrated by Benfica fans with specially made scarves, but Lopetegui was pleased by how his side recovered. "We showed great personality to come back after our game in midweek," said the Porto boss. "We deserved to win the game. One team tried to attack and the other to defend." Jesus is no stranger to touchline confrontations. He exchanged angry words with then-Tottenham manger Tim Sherwood during their teams' Europa League meeting in March 2014. Match ends, Benfica 0, FC Porto 0. Second Half ends, Benfica 0, FC Porto 0. Substitution, Benfica. Ola John replaces Jonas. Attempt missed. Hernani (FC Porto) left footed shot from a difficult angle on the left misses to the left. Assisted by Ricardo Quaresma with a cross. Attempt missed. Jonas (Benfica) right footed shot from more than 35 yards is close, but misses to the right. Maicon (FC Porto) is shown the yellow card for a bad foul. Foul by Maicon (FC Porto). Offside, FC Porto. Marcano tries a through ball, but Casemiro is caught offside. Óliver (FC Porto) wins a free kick on the right wing. Julio César (Benfica) is shown the yellow card. Delay in match Casemiro (FC Porto) because of an injury. Attempt missed. Lubomir Fejsa (Benfica) right footed shot from the centre of the box is too high following a set piece situation. Foul by Casemiro (FC Porto). Nicolás Gaitán (Benfica) wins a free kick on the right wing. Foul by Óliver (FC Porto). Eliseu (Benfica) wins a free kick on the left wing. Substitution, Benfica. André Almeida replaces Pizzi. Dangerous play by Casemiro (FC Porto). Offside, FC Porto. Maicon tries a through ball, but Héctor Herrera is caught offside. Marcano (FC Porto) is shown the yellow card for hand ball. Hand ball by Marcano (FC Porto). Attempt missed. Lima (Benfica) right footed shot from outside the box is too high. Assisted by Lubomir Fejsa. Corner, FC Porto. Conceded by Eliseu. Offside, FC Porto. Alex Sandro tries a through ball, but Casemiro is caught offside.